Below is a list of stocks that I purchased this week. I had many small orders since I still have dozens of free trades I need to use up before mid September. The theme for this month is safety and low volatility. I am extremely cautious right now as the S&P500 gets higher and higher and the VIX gets lower and lower. Investors should exercise caution in making sure their investments are of good value. The stocks I purchased this week are what I consider sleep well at night (SWAN) picks. MCD, MO, WMT, and GIS are the safest stocks in this week's purchase list. I believe that even during a recession, these stocks will continue to pay their dividends. Since I am still young, a market correction does not worry me since my portfolio balance is still very small and a negative capital gain can be easily offset by my monthly contributions. My goal for the current market situation is to buy stocks that provide growing dividend and capital growth in the past, and are functional businesses during market corrections. The stocks in this week's purchase all have had minimal losses during the subprime crisis, 9/11 attack, tech bubble, and the Asian financial crisis. The stock is fairly priced. It has taken a dip recently. Yield is over 3.2% when I bought it which is on the higher side of stocks I have now. I like this company because it has very low volatility during recessions. The stock has been sideways for several months but I am not concerned over its short term capital gains. The stock is slightly overpriced but I wanted to increase my position to a full position. I bought after the ex-dividend date when the stock took a 3% dive. I believe MO will continue paying growing dividends. The stock has low beta so it is one of the safer stocks to hold during a crash. I bought this stock with the understanding that capital gains will most likely be unexciting, since MO is at all time highs. I bought this stock for its dividends and stability. The yield is 4.63% when I bought it, making it one of the highest yielders in my portfolio. I bought WMT after the recent dip. The yield is 2.55%. The company still operates well during a recession so I consider this another safety stock. I believe I bought it at fair value. This stock is low beta and many customers will still shop at Walmart when their stocks lose half their value during a depression. I added to my shares of GPC. Not much excitement for GPC as it's been flat for a long time. The stock offers a decent 2.7% and has been paying increasing dividends for many decades. I believe I bought this stock at fair value. The stock is slightly more volatile with a beta of 0.72 when compared to my other portfolio picks. However it is still a safe bet compared to a S&P500 index. I added to my small position in ROST after it dropped even further. The stock is a low yielder but has lots of growth. I believe this stock is undervalued. I have more faith in ROSS than TGT since ROSS has a much more solid balance sheet over the last 10 years. Same with ROSS, I added to this stock after it dropped further. This stock is undervalued. I pair my TJX investment with my ROST investment since they're nearly identical. My total cost basis for TJX and ROST now stands at around $2000. The stock is slightly overvalued. I bought into it after a small dip. The stock is a 3% yielder with extremely low beta. I am holding this stock not for capital appreciation but for its stability and solid dividends. 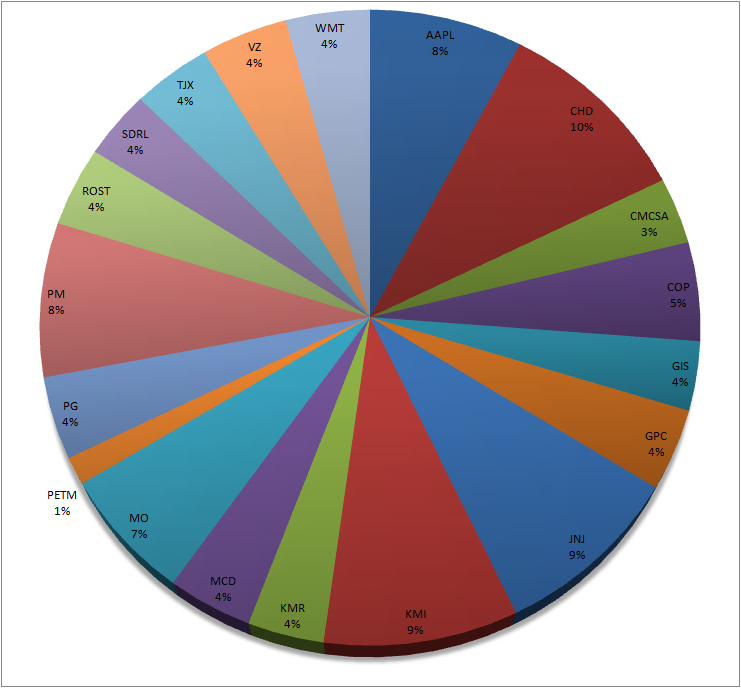 The current stock portfolio weights are shown below. Apple is a bit over-allocated for my taste. I intentionally have a large allocation tobacco (PM and MO). I also have a large allocation to Kinder Morgan (KMI+KMR) which is intentional. JNJ and CHD are companies that I believe will always be solid dividend payers, with CHD being more of a growth stock. TJX+ROST count for 8% of the portfolio. These two stocks are growth stocks that have extremely solid balance sheets over the last 10 years and have recently gone on sale due to the "cold winter". The other stocks in my portfolio are of normal allocation. Every month I will post a portfolio summary of how my stocks did in the last month. In the noise of things, I don't think that fretting over monthly price fluctuations is worth it. However, doing this every month will allow me to keep record of what has happened. I also think it is interesting to see how my stocks are paying off. May was the first month of my dividend investing journey. I transferred my taxable Vanguard index funds to a brokerage this month. I am still waiting on my Roth IRA transfer from Vanguard. At the moment, my 401k is still on Vanguard index funds and I plan to keep it that way. This post will summarize the results of my dividend stock portfolio for the month of May 2014. The market this month did very well. There were a lot of dips that I bought into that are starting to pay off. I am a little nervous at the moment of ever increasing stock prices. A lot of stocks have entered "zombie" like periods where they just continuously increase without any fluctuations. I am thinking of saving some % of my portfolio in cash for some margin of safety. Below is an illustration of stocks sorted from top gain % to lowest gain %. Some high % gainers may have less dollar gain than others since some stocks have less weight in the portfolio. Apple has climbed unexpectedly high after the Beats purchase and the coming 7-1 stock split. I am quite happy with its performance so far. AAPL's PE is starting to approach the value it had in its past peak, so I am thinking about selling part of this stock and moving the money to dividend champions. Apple has a higher beta than most stocks in my portfolio and I am not comfortable with holding the stock during a market high. I bought PetSmart after a massive sell off after unexciting earnings reports. The price has jumped dramatically as investors suddenly realized that PETM was extremely well priced for a business with a very clean balance sheet. I bought Seadrill when they announced their partnership with Rosneft in Russia. The opportunity presents a lot of new drilling contracts for SDRL. The stock has risen handsomely since then. The price has fluctuated a bit as most analysts are still SDRL-haters for the last several months, but it seems most people are catching up with this stock. SDRL is highly volatile and provides a very high dividend yield of around 10%. The stock has the highest beta my portfolio and I considering selling it after it reaches its past peak. Comcast and ConocoPhillips have both risen quite well. I am quite concerned with COP's bull run but its PE is still relatively low compared to its competitors. COP still has a high yield after its run up in price, so even if it drops in price I will be happy to buy more. Comcast has low yield so I only have an entry position. I bought CMCSA for its growth. Kinder Morgan (KMI and KMR) have been climbing steadily since I last purchased the stocks. Kinder Morgan has been hit hard by analysts and website commentary for the last several months. They have performed behind their other peers and the stock has been mostly sideways. I am a fan of Kinder's business and believe their pipelines will be in high demand with the ongoing oil renaissance in America. The stocks also offer very high attractive yields with low beta. Church and Dwight climbed by a small amount over the last couple weeks. However, the percentage increase is not high and the only reason the dollar increase is bigger than other stocks is because of my large allocation to CHD. I am a fan of CHD and consider it one of my core holdings. MO and PM also have continued their zombie-like increase to record highs. Their percentage increase is small but my allocation to tobacco is large. TJX was dropping several percent below what I bought the stock for. However, it has recently climbed back to around the same price as what I paid. ROST has stayed relatively unchanged. I believe these stocks will see higher profits in the summer and holiday season this year, which should promote their earnings. Both TJX and ROST have solid earnings and dividends in previous years, even through recessions. I consider these two to be part of my growth dividend stocks allocation. I am considering adding to MCD, WMT, PG, and starting a new position in CVX this month. At this moment, I have around $3980 in cash for stocks and emergency funds. Some of it is still in the bank but I will have around 3000 cash in my brokerage account by this coming Thursday. I have a check sent out to my broker which should arrive on Thursday of the coming week. The account already has some cash ready for opportunities. I have had difficulty finding stocks that are of good value this month. I plan to keep some of my brokerage account in cash. I am targeting 5-10% in cash unless I can find a good value company. For now, Target (TGT) appears to be quite attractively valued, but I missed most of the opportunity a couple days ago. Also I am too heavy on retail with ROST and TJX and PETM. PETM has jumped up quite a bit since my last purchase, since it was so oversold. ROST and TJX are around the same price as I purchase them last but I am seeing a slight momentum going forward. I think ROST, PETM, and TJX are still good deals with strong balance sheets but I do not want to add anymore to them since I already have a core position. I also do not want to expand positions in low yielding companies. This desire also removes Visa from my list of stocks. Aflac (AFL) is also attractively priced at the moment. I also feel Wells Fargo (WFC) is a decent stock right now. However I do not like insurance and banks in my portfolio for volatility reasons. I prefer to buy these stocks at a severe market correction when their yields spike and then sell when they return back to market level. I am also considering adding even more to Philip Morris (PM) and Kinder Morgan Inc (KMI) but my positions are already so large compared to everything else. I would like to Altria (MO) but the stock is much more overpriced compared to PM. Similar story with LO. I probably will supplement a couple shares this month. My stock trade fees are $0 until September so I am not worried about trading small transactions (bad habit to be honest). I have also been eyeing utility stocks like ED and WEC and NEE which have recently become cheaper, but I plan to allocate sources to utilities later on this year. I prefer putting high yielders in my Roth IRA and am more focused on setting up my Taxable portfolio. I have a Roth IRA being converted from Vanguard indexes to a brokerage right now. The stocks I am eyeballing now for purchase are WMT, PG, MCD, and CVX. I like PG and MCD since they are conservative, have decently high dividends, and are resistant during a recession. MCD has had better returns in the past than PG, but lately MCD has been stalling around the 94-100$ mark. MCD's momentum has started to decrease with its latest dividend increase as well. Of the four, I think PG is a little expensive since its PE>20, but then again PG is usually overpriced at this mark. I have a pet peeve for PEs over 20 though. I think CVX is slightly overpriced compared to its history but the yield makes it appealing. CVX also has the highest volatility of the four. Below are graphs showing the 10 year and 2 year plots of the 3 stocks. There are Bollinger bands around the stock price as well as the PE and Yield. Notice how the stocks are all quite expensive at the moment. Walmart: The stock took a dip a couple days ago. I bought a small start in this company during that dip. The PE is around 16 with a appreciable yield of 2.49%. The beta is low at 0.46 and this stock is a dividend champion. Walmart has shown that it does well during a recession. Procter & Gamble: The stock is quite unexciting. Past returns of PG including dividends are not very impressive. However, the company has strong fundamentals that operate very well during recessions. The stock is a little expensive right now with a PE of 21.6, but the dividend is high at 3.21%. Before the crash of 2009, PG hovered around 20-25 PE so this PE range isn't abnormal. The high dividend yield compared to other stocks makes it still valuable. The stock carries a low beta of 0.42. When the market goes down, one can be quite confident PG will continue paying quarterly dividends like Walmart. McDonald: 3.18% yield at 18.50 PE. Not much to say here about the company. Solid dividend stock. It actually proceeded past 2008-2009 as if nothing happened... The price is at a triple peak if that means anything to data analysts. The beta is really low at 0.30, like a utility stock. MCD recently payed a dividend. The dividend hike has been reported to be 5% which is quite low. I don't have much expectation for MCD to grow much more than it already has, but I would like to hold it for its dividend and solid business model. Chevron: The lowest PE of the four. Oil usually has a lower PE. Chevron is cheaper than XOM. The PE is currently 12.09 with a dividend of 3.45% which beats XOM's yield of 2.72%. The beta is around 1 which I expect from a big oil company. CVX had a recent dip but is climbing back up. In the large scheme of things, I would be more willing to dollar cost average than time the market. I do not have anything in CVX at the moment, which is why I put this stock on my radar list. I think it will pair very well with COP in my portfolio. In summary I feel that the market at this point in time is very expensive. Stocks are hard to find with decent yield and PE. The stocks listed here show what crumbs I could find in the dividend champions list. I am still building the core of my portfolio so these stocks are important. I am favoring WMT and MCD here, with CVX being a 2nd priority, and PG being a 3rd priority (since I already hold some PG and its got a PE>20 and it's performed really slowly over the last 10 years). I added a Progress page, which you can access on the top, to illustrate how far I am to financial independence. The page will show a plot of net worth over time. 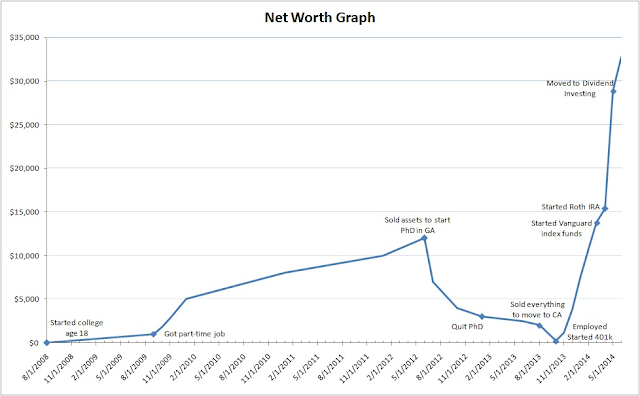 The graph is a sum of my emergency funds in my bank account and the total sum of all my portfolios. I will update this graph every month when I make a purchase. I am steadily increasing my portfolio value as well as my emergency fund every month. I'm putting less emphasis on the emergency fund for now. 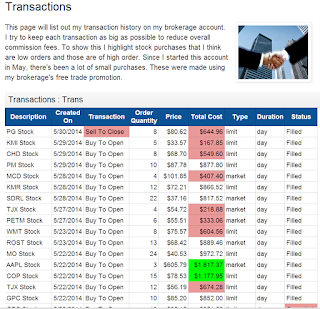 I added a Transactions page at the top so readers can see my recent buys and sells. I will update this everytime I make a trade. It shows how many shares I purchased, for what price, and on what day. I also made a lot of changes to the Watchlist page. I now have it synched with the spreadsheet that I use to watch stocks. I will add to this regularly. 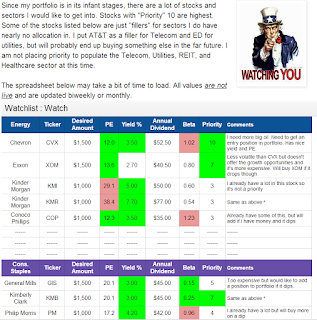 The Watchlist now prioritizes stocks that I am scouting. 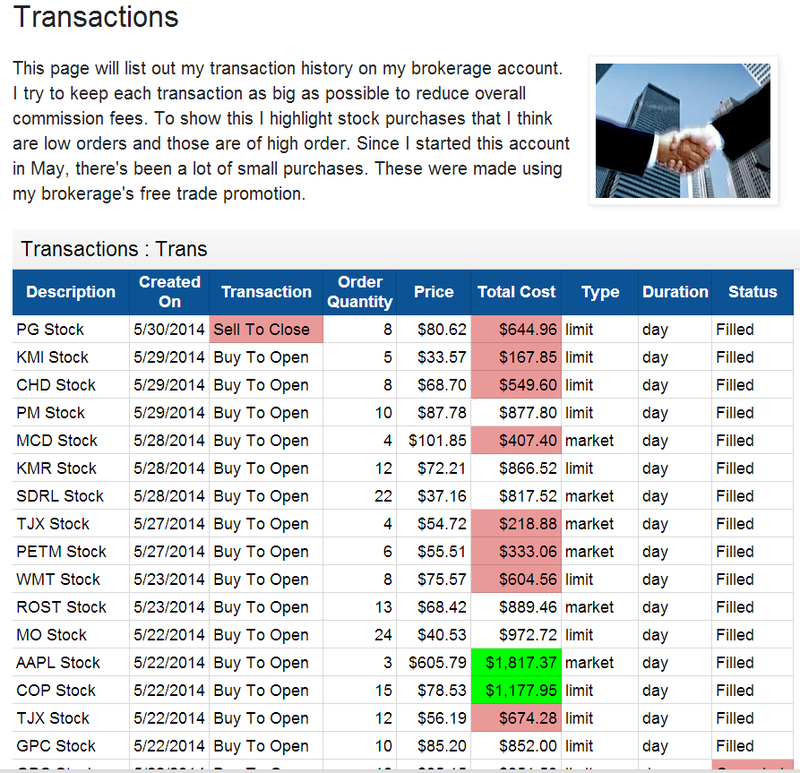 I also list their PEs, Yield, and Betas which makes it easier for me to screen stocks quickly. Stocks here may change around a lot depending on market mood.